The Russian market is flooded with illegally made vodka and smuggled bottles from neighbouring Kazakhstan. Production of vodka decreased by 30 percent in Russia in May after the market was flooded with illegally made bottles of the strong alcoholic beverage following a rise in excise duty earlier this year. Production volumes have been declining since the beginning of the year, according to business daily Kommersant. The drop was 30.3 percent in January, 25.8 percent in February, 22.1 percent in March, and 17.9 percent in April. Spirits producers attributed the decline to large stocks made at the end of 2012 before a record increase in the excise tax, according to Kommersant. The illegal market has been boosted by smuggled vodka from neighbouring Kazakhstan, part of the Customs Union, says the vice president of the Russian Standard Igor Kosarev. "The excise tax is five times smaller there, so our market is very attractive to them," he said. The fight against illicit trade was one of the main reasons for setting up the Federal Service for Alcohol Market Regulation in 2008. The introduction of minimum prices for vodka, cognac and other alcoholic beverages, which contain more than 28 percent alcohol, and the change to the taxation system are among the measures taken by the organisation. After that the illegal vodka market shrank to 24 percent from almost 50 percent in previous years, according to Kommersant. "Before the beginning of this year illegal vodka was washing out from the market. Now, thanks to a sharp increase in excise duty, the process has reversed," Dmitry Dobrov, chairman of the Union of Alcohol Producers told the paper. He says legal production of vodka could decline even more in the future as illegal market is growing as "the margin there now is just fantastic." Illegal vodka now makes up a third of the market, according to experts cited by Kommersant. 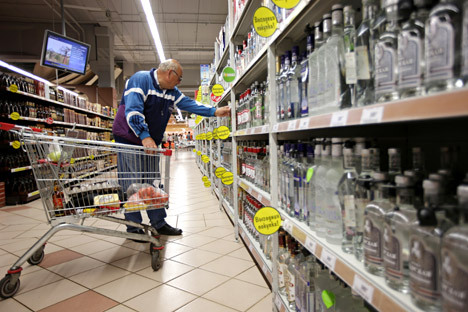 The Russian Ministry of Finance plans to further raise taxes on alcohol. The excise tax on alcoholic beverages could increase up to 25 percent on spirits, 14 percent on wine and 4 percent on champagne. Russian vodka sales may decrease by a further third within five years due to the government’s duty tax rises; its pressure on the illegal trade; and the shift by consumers to new categories, Renaissance Capital estimates. Vodka is still the most popular alcoholic beverage in the world, according to the recent report by the UK-based International Wine & Spirit Research (IWSR). The global consumption of vodka was 4.44 billion liters in 2012, according to the report. Russians were responsible for drinking nearly half the global total, the equivalent of 14 litres per person. The US is the second biggest vodka consumer with 1.9 litres per person. In 2012, global spirits consumption grew by 1.6 percent to 3.07 billion nine-litre cases compared to 6.5 percent growth in 2011, according to IWSR.